Remember the angel food cake from the other day? A good thing to serve it with is lemon curd. I like to cut a slice in half, smear it with lemon curd, and eat it like a delicious sandwich. 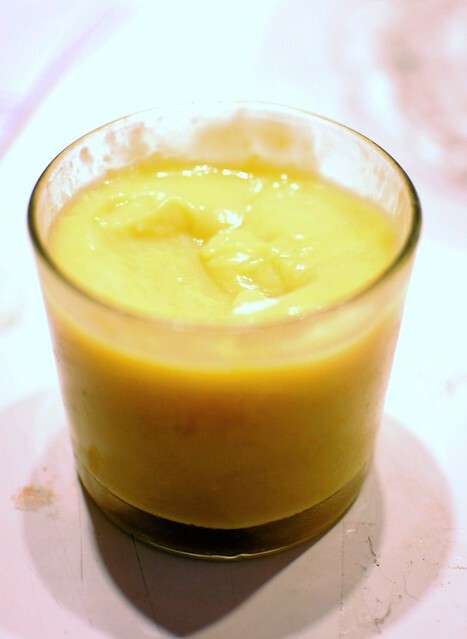 I've made lemon curd a bunch of times, but never this way. Normally, you combine the ingredients and cook them slowly, then strain. That's the worst! Straining lemon curd is messy and the last thing you want to do after you've been standing over the store stirring it for 15 minutes. This recipe is a little easier, you do the blending ahead of time and once you're done with the cooking, you're done. Cream the butter and sugar, then beat in the eggs and yolks. Mix in the lemon juice. It will look curdled, don't worry. Pour the lumpy mixture into a heavy saucepan, and cook slowly, stirring, until thickened. Stir in the zest, pour into a bowl, and press plastic wrap over the top to keep a skin from forming. Cool before serving, store in the fridge.